Central Illinois Ag prides itself on taking care of the people who take care of the land. At Central Illinois Ag, we strive everyday to give our customers solutions attached with real value. We have grown to one of the largest Case IH dealers in the country. 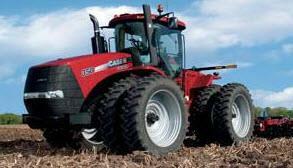 We don't only provide Case IH, we have plenty of other best-in-class equipment. With over 100 years of developing a wide product line, we are now stronger than ever. Here at Central Illinois Ag, we grow along with the latest technological equipment and continue to serve the ever changing needs of numerous farmers. Central Illinois Ag is also a full-service dealership that provides the following manufacturers: Landoll, J&M, Brent, Ag Leader, Bush Hog, Thunder Creek, Maurer, Unverferth, Hardi, Toro, Yetter, McFarlane, Blu-jet, and many more. Detta är företagssidan för Central Illinois Ag-Clinton placerat i United States, IL, Clinton. Företaget erbjuder följande tjänster: begagnade maskiner, ny utrustning, reparation, reservdelar och extrautrustning. Central Illinois Ag-Clinton representerar: Case IH, Mac Don, Geringhoff, Kinze, Landoll. Företaget är specialiserat på Central Illinois Ag, Case IH, International, Combine, Tractor, Tillage, Planter, Quad Trac, Kinze, Grain Carts.